'This Ajay Devgn video game gets more unwatchable with each minute -- and there are 173 of them,' rues Raja Sen.
Girish Karnad is in Shivaay. The venerable actor, a luminary of the stage and screen, here plays a wheelchair-bound father asking his daughter to invite a young girl in from the cold. The daughter, fresh off an encounter with the titular chap, Shivaay, is too thunderstruck to really hear him, and so the crippled father, determinedly starts hoisting himself out of the wheelchair, only to fall back into it, drained. The shocked daughter asks why he did this, to which Karnad says -- in the voice of a fine actor ambushed by a paycheque -- that someone has to stand up. It is an awful line following an awful moment, and sounds unforgivably tawdry in Hindi, but giving Girish Karnad horrid innuendo is not the worst of director Ajay Devgn's sins. Where, in fact, can one begin? Perhaps at Devgn himself, a man who casts himself as invincible and flawless, a director influenced by such immodest greats as Saint Gurmeet Ram Rahim Singh Ji Insaan and Madhur Bhandarkar. Devgn, we learn, is a filmmaker who enjoys making jokes about the divinity of his own genitalia. Perhaps at the way this film is shot in Bulgaria but pretends it's in Everest, which is why Devgn turns around to a Bulgarian girl at a Bulgarian mountain and chest-thumpingly asks her if they have views like this in Bulgaria. Perhaps at the way Devgn's character, Shivaay, stays shirtless in snowy hills and prefers to take a dramatic pause -- to properly sell a bad line of dialogue about the best laid plans -- instead of warning a troupe of people he's led into the hills. The whole thing is a catastrophe. Devgn's Shivaay is a self-celebrating (and frequently shirtless) mountain guide who 'makes love' to a buxom Bulgarian girl while they're both falling down a hillside in a transparent tent -- possibly what the director believes 'zorbing' means -- and the two fall in love. She gets pregnant, a fact delivered to the couple by a doctor who speaks slowly to white people as if they're all Siri, and Devgn's reaction to this is to drive the pregnant girl home like a maniac and start yelling at her. But then he offers her a glass of milk. ('Devgn Offers Women Milk' was the alternate title for this film, but was rejected by Devgn himself because it took up too much space away from his face on the poster). She wants an abortion because she has plans for her life, but along with this milk stands Devgn's offer that she have his child and leave it to his care and only then go off to her plans. She acquiesces to this insane demand, one that Devgn then decides to resent her for. Anyway, the little girl grows up and wants to see her mother, so Devgn carts her off to Bulgaria without once checking where the lady lives. They get there, the girl gets taken -- oops -- and the rest of the film is an inane series of car-chases and imbecilic behaviour during which Devgn is shot and battered and beaten but none of it appears to slow him down. He's wearing a directorially-omnipotent forcefield, you see. With Aseem Bajaj at the camera, the film is well shot but rather sloppily choreographed. This Ajay Devgn video game gets more unwatchable with each minute -- and there are 173 of them -- during which he is wrongfully imprisoned and meets a lawyer who advises him to forget he's a father. Later, a roomful of cops wait around for Shivaay, the most wanted man in the country, to look thoughtfully at them and make a call before they start chasing him. 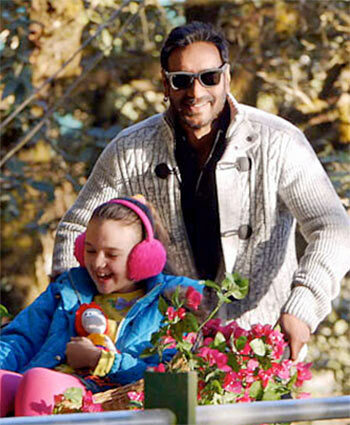 Shivaay's kidnapped daughter, played by an adorable girl called Abigail Eames, is a mute child, which makes me believe that this film is, on some warped level, Devgn's version of Salman Khan's highly effective Bajrangi Bhaijaan. Except in the Devgnverse, Nawazuddin Siddiqui is replaced by Vir Das -- a decision that really tells you all you need to know about this film. Devgn might believe Shivaay is a piece of Shiv, but there's an obvious typo there. To invoke a truly superb avalanche-filled film, this one may as well have been called Force Manure.